J.T. Soby, Ren Magritte, exh. cat., The Museum of Modern Art, New York, 1965, p. 19 (illustrated, pp. 64-65). J.J. Spector, Aesthetics of Freud: A Study in Psychoanalysis and Art, New York, 1972, p. 175 (illustrated, figs. 33-34). H. Torczyner, Ren Magritte: signes et images, Paris, 1977, pp. 146-147, nos. 277-284 (illustrated). S. Gablik, Magritte, New York, 1985, pp. 106-107 and 203, nos. 98-106 (illustrated, pp. 104-105). H. Torczyner, L'Ami Magritte: correspondance et souvenirs, Antwerp, 1992, pp. 155-156 (illustrated). R. Magritte, Magritte/Torczyner: Letters Between Friends, New York, 1994, pp. 113-120 (illustrated). Lettres persanes are preliminary drawings for the oil painted the same year, Un Peu de l'me des bandits. Magritte told Andr Bosmans in a letter of July 1960 that they are "the result of inspiration which occurred at the end of the research posed by the problem of the violin: As always, from the beginning of the research, the solution was contained in the first drawing (which included a 'knot'), I had to discover what it indicated: the white knot of a formal collar. This first image is 'good' and would be worth painting...even though it is not an answer to a problem" (quoted in D. Sylvester, S. Whitfield and M. Raeburn, Ren Magritte, Catalogue Raisonn, London, 1993, vol. III (Oil Paintings, Objects and Bronzes 1949-1967), p. 322). 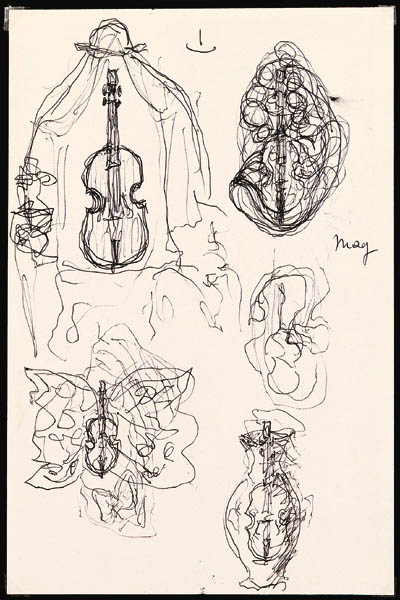 In these drawings, Magritte experiments with the resonances of different images in relation to the violin--as the body of a butterfly, the spine of a leaf, and the body of his character 'The Healer,' among others. Sylvester notes that the numbering of the sketches may have been an afterthought by the artist, in order to show the progression of the images which led to the discovery.